Wanna sit front row in the New York Fashion Show? Yeah, well, unless you're an A lister that'll probably never happen. BUT you could sit front row at the Sash & Belle "Dress Me Up" event this weekend to raise money for Ovarian Cancer Research. Surely that's a close second? Owner of Sash & Belle handbags, Kristy McPhillips, has put together a spring catwalk event to launch her SS14 handbag range and to showcase some of the local dress shops around the ACT. All for a good cause of course. Models from around the ACT are volunteering their time to help Kristy raise money for the Ovarian Cancer Research Federation. Including Miss World ACT 2014! For just $27 a ticket you can drink sparkling wine and eat scones and cakes while checking out the spring/summer fashion. Businesses such as Enchante Formal and Bridal Wear, Tressle, Things of Desire, Intimo and Little Yellow Wagon will be showing their new lines. You'll also get to see the Cheer Chicks perform and meet Cheer Chick Charlie. Plus there is a HEAP of fantastic raffle prizes to be won including a weekend away, a formal gown, beauty products, gift vouchers, movie tickets, a fascinator, toys, books, clothes ... even a handbag cake! There will be a representative from OCRF to tell her story. Local business woman Natasha Vanzetti will be emceeing the event. For the cute factor there will be iddy biddy child models. 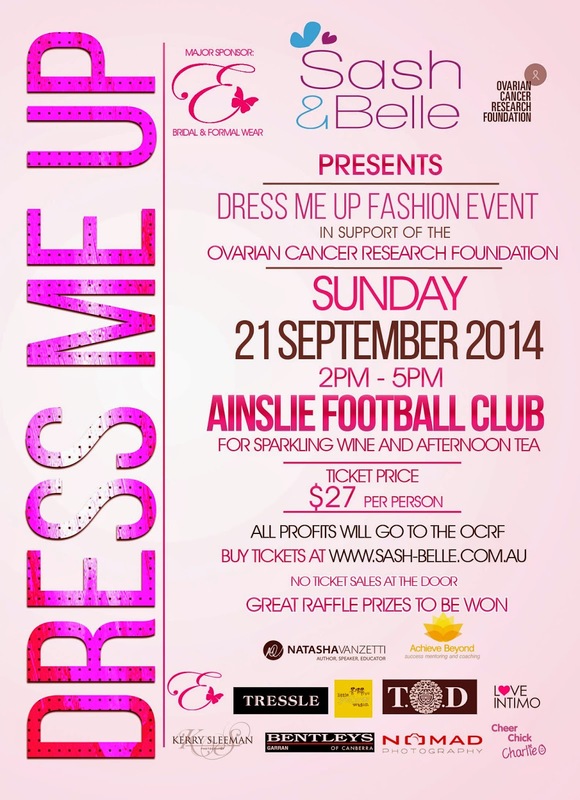 You'll also have the chance to purchase from the Sash & Belle collection with 20% of handbag sales going to OCRF. So who needs New York Fashion Week when you've got "Dress Me Up" in Canberra instead? The event is being held next Sunday 21 September from 2.00-5.00 at the Ainslie Football Club. Tickets must be purchased beforehand from either Enchante in Fyshwick, or from the Sash & Belle online store. Achieve Beyond and Cheer Chick Charlie are sponsoring the event, plus Tahlia is walking in it, so I'll be there!